Israel blamed Hamas for a "terror tunnel," calling it a "serious threat to Israeli civilians." The Israel Defense Forces says it's destroyed a "Hamas terror tunnel" connecting the Gaza Strip to Egypt and Israel. The tunnel was reportedly a mile long and ran underneath a main border crossing site, adjacent to gas and diesel lines. This is the third tunnel the IDF says it has destroyed in two months. Underground passageways were a distinct advantage for Hamas in the 2014 armed conflict with Israel. The IDF announcement comes amid heightened tensions between Israel and Palestinians after U.S. President Donald Trump recognized Jerusalem as Israel's capital. Since then, militants in Gaza have launched at least 18 rockets or mortars into Israel; Israelis have killed at least 15 protesters and two gunmen. Israel called the tunnels a "serious threat." While they can be used to smuggle goods into Gaza, which is under air, sea and land blockade, they can also be used to move militant troops and weapons without drawing attention. If the most recently destroyed tunnel had connected terrorists to the Sinai peninsula, that could hamper relations between Hamas and Egypt, which is dealing with an ISIS-affiliate in the peninsula, which borders Gaza. 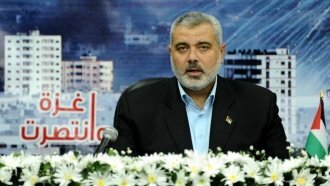 As of Sunday afternoon, neither Hamas nor Egypt has given a comment.